But as I look back there have been some delicious successes along the way and this salad is one of them. Probably because it is so simple. Simple to prepare, simple in the list of ingredients and very simple to enjoy! I found this on tasting spoons, Carolyn has a detailed eye for finding wonderful and different recipes among different cooking classes, cookbooks, and publications.I often times look to her for inspiration for our Sunday dinners, with great success. 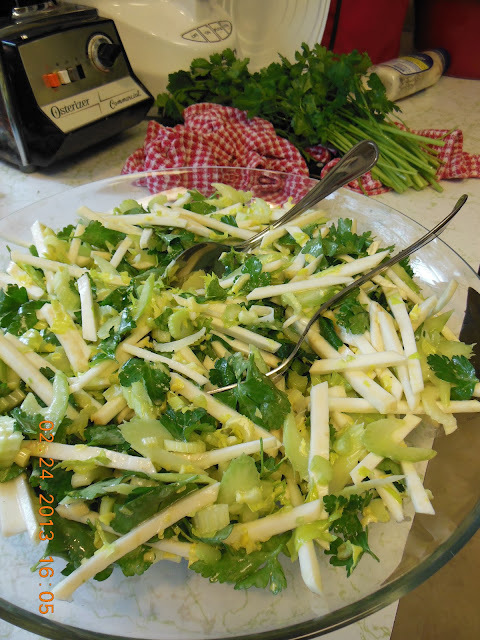 Peel and cut celery root into matchstick sized pieces, you may also grate using the large side of a box grater. Wash, dry and thinly slice the ribs of celery on a sharp diagonal. Remove the leaves only from the parsley, you will want at to fill a 1/2 cup measure, more is fine. Combine all ingredients in a large bowl. Pour over vegetables, toss to mix well. You may let this sit at room temperature for up to an hour before serving. It will soften in texture, but still be very crunchy and delicious! I'm not a an of raw celery. I don't mind it cooked in soup but have never gotten use to the taste of it raw (maybe if its covered with peanut butter). I am a salad lover though and make at least two or three a week. Have a great day! Oops, thought it didn't go through. Or maybe my comment was soooo important that it needing repeating. My husband would be a happy man if I made this for him. He loves celery! The horseradish seems like an odd ingredient here, but we like it, so sure why not? You post some very interesting recipes I would never think of -- THANKS!